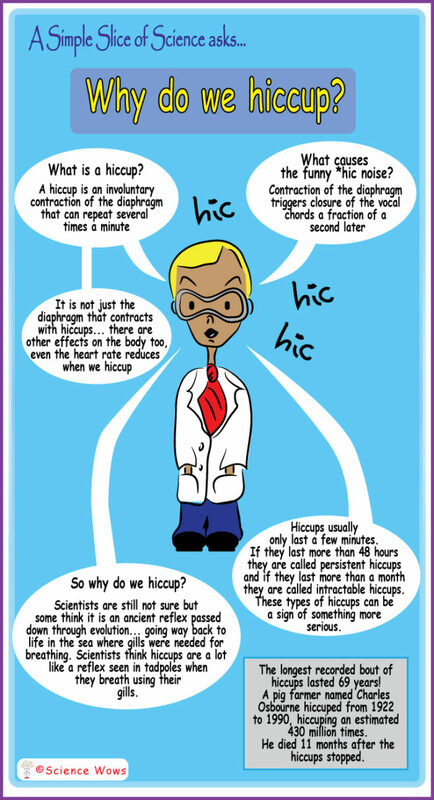 A Simple Slice of Science – Why do we hiccup? Here is something new to the blog… A Simple Slice of Science! With these posts I hope to answer a little science related question in 30 seconds or less. These posts will be presented by a new character on the blog…. folks, meet Dr. Simple! What can I say about Dr. Simple? 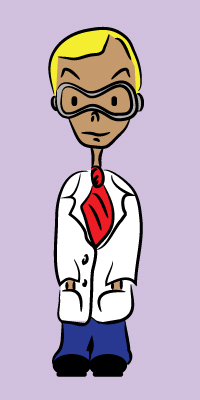 Well, he is a bit of a lab coat nerd, you can tell just by looking at him, right? The good thing about Dr. Simple is that he is a man of few words so a perfect candidate for presenting one science topic in 30 seconds!! In a nutshell… Dr. Simple likes to keep it simple! I am hoping that A Simple Slice of Science will become a regular spot on the blog, so if you have any science type questions that you wanted answered in a 30 second way, leave your question in the comments below and Dr. Simple will be only too happy to give an ever so simple answer! First up… Dr. Simple has been struck by a little bout of hiccups! He thought it might be a good opportunity to tell you a little about what they are and how they work… all in 30 seconds! I hope you like this new spot, please do leave me a comment telling me what you think, and remember… keep those questions coming! ← A new Mystery Creature for this week – can you name it? I love Dr. Simple! What a great idea and I’m fascinated with the ‘history of hiccups’. That poor farmer – I’d lose my reason! One of my little ones told me today that she thought it was the trees that made the wind by ‘flapping their leaves’. I thought it was a sweet way to look at it, and didn’t really want to take the magic away – but then, thinking about it later I was sort of at a loss as to how to explain how the wind ‘works’ in simple terms. I’d love if Dr. Simple could help this mama out! What a great question… watch this space… although I prefer your daughter’s explanation… how beautiful. I just love the way the world looks through the eyes of a child! 69 years! !How did he not go insane after the first few days! !Great post.I like Dr Simple and his approach!Could do with some simplicity in my life right now! This is so perfect for anyone with kids – I am very happy right now. You are going to get every single question my kids ask me from now on – sorry in advance! Yay… bring it on 😉 Dr. Simple is ready!